I have 10 stitches on my needles in these photos. Now you are ready to knit the second row of your project. I have 10 stitches on my holding needle. 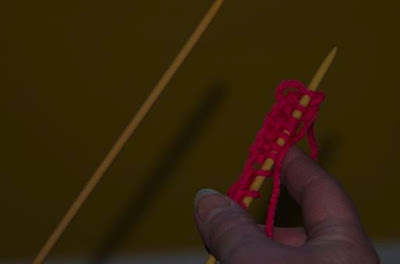 The first steps for knitting the next row is the same as you did for the second stitch of the knitted cast on. Insert the working needle between the first, the stitch closest to the tip, and second stitch on the holding needle. Slide your working needle up and through that first stitch and to the back of the holding needle. Tuck the button end of the working needle into the belt, to free your hand. 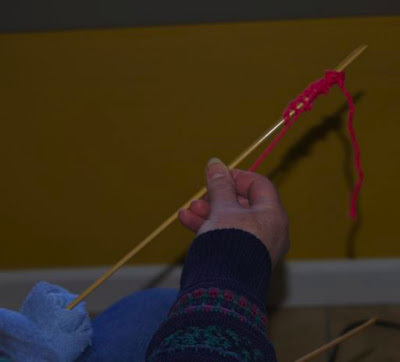 Move the yarn away and below/behind, both needles, then up and between them. 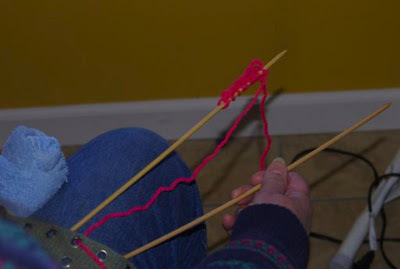 Putting a length of yarn between the needles. Pull the button end of the working needle from the belt. Hold the long tail with the working needle and pull a new loop through the old loop. STOP you now have a new loop on the working needle that is still part of the old first stitch on the holding needle. You now need to drop the old loop off the holding needle. 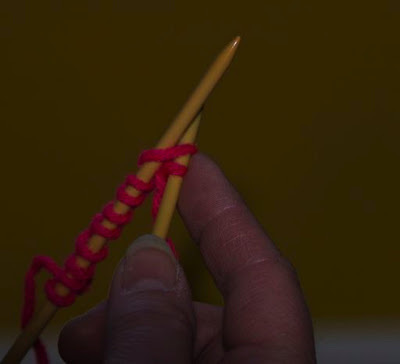 Hold the new loop with your index finger, and the second stitch on the holding needle with your thumb and work the old stitch off the holding needle. Keeping a firm tension on the long tail will help me control the stitches you are working with. In the picture below the old loop is between the tip of my first finger and my thumb just behind the point of the holding needle. This I'll let go of. You will have one stitch on your working needle and 9 on the holding needle. You have knitted the first stitch of the second row. Repeat these steps to make the rest of the second row of stitches. The new stitches are made from the old stitches on the holding needle and kept on the working needle. I found I used the first joint of my first finger to hold the newest stitch/loop on my working needle. 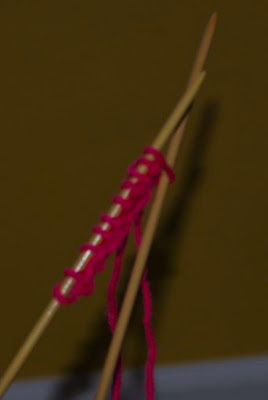 Put the point of the working needle between the first and second stitches on the holding needle. Slide the point of the working needle up through the first stitch. Tuck the working needle into the belt. 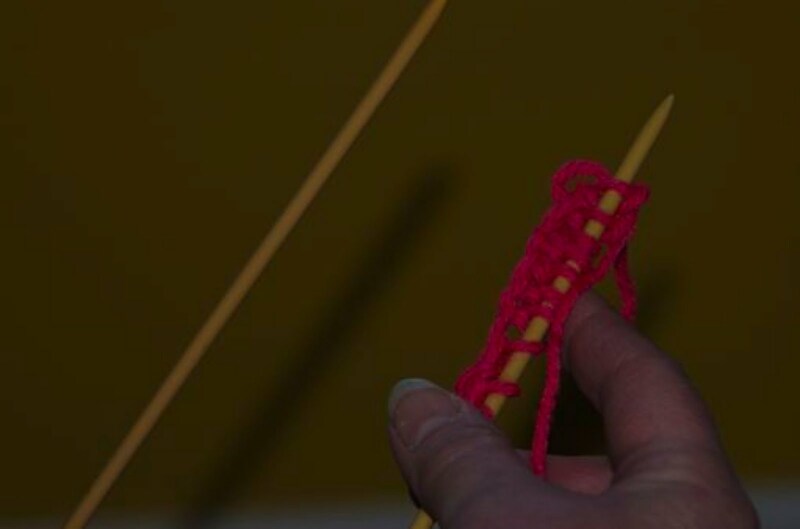 Continue these steps to knit the second row of your project. Your are placing new stitches onto the working needle and removing older ones from the holding needle. Each new loop has been drawn through the loop of an older one. When all the stitches have been transferred from the holding needles to the working needle, push the stitches down the needle so that you are sure they will not come off. Tuck the button end in the belt. Pull the empty holding needle out of the towel and insert its button end in the belt. Both needles are now held by the belt. Pull the working needle with all the stitches on it out of the belt and the button end o into the towel making sure you don't push any stitches off. Presto Change O, the needle in the towel with all the stitches is now the holding needle and the empty needle is the working needle. The second row of your project is done. The following rows are knitted the same way. 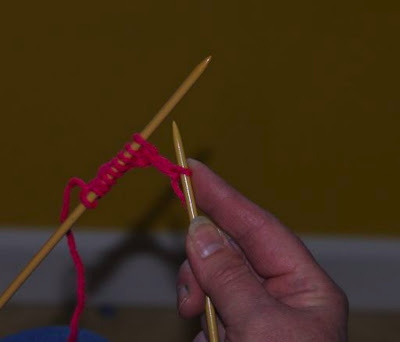 When you 'work in progress' or as knitters abbreviate it WIP, is as long as you want it, it is time to bind off. 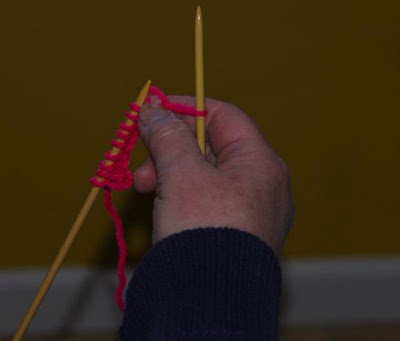 Go to Bind Off, Knitting One Hand.